If you are looking to get the best yellow jacket trap but you don’t know what option you should choose, this short paragraph will give you all the information to help you decide. After extensive analysis, we have concluded that the Victor Yellow Jacket Trap is the option that you ought to consider. The trap comes with bait included and it can control many types of flying pests including flies and fruit flies. There are no poisons used so that you can rest assured knowing that you’ll be able to use it around your family, kids, and pets. The bait is effective in all geographic regions which is a very big plus. Similarly, if you want to get yourself ready to catch all the pesky yellow jackets around your home, you may want to consider getting the Rescue Attractant Cartridge as a second purchase. With this nifty option, you will be able to control the yellow jackets, flies, and fruit flies population around your home. It does not use hazardous sprays so that you can safely use it in your home. As a plus, the bait used for this option is effective in all geographic regions. Not all customers were happy with the construction of this unit, and some commented that the plastic is very cheap and it can crack easily. It’s a great pick for anyone looking for a 100% safe and poison-free product that is as effective as it is easy to use. This powerful attractant is designed to lure and trap yellow jackets and will not harm or trap beneficial honeybees. It will continue to attract flying vermin for up to 10 weeks and works best when used with a Rescue reusable trap. As a plus, the formula is completely natural. 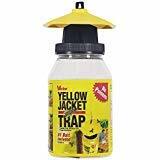 A few buyers were a bit disappointed with this option, claiming that the attractant they received was dry and unable to lure any yellow jackets to the trap. This set of five attractant cartridges offer good value and will keep your trap well-supplied for the entire year. You can catch up to 18 different species of stinging pest insects with the help of a single product. It is made not to harm any of the beneficial insects, and the environmentally responsible design means that no harmful killing agents are used to attract and trap the insects. Unfortunately, even if this is advertised as a multi-purpose trap, customers have reported that if you wish to catch paper wasps, you will have to look elsewhere. With this set of three high-quality traps, you can protect your home against yellow jackets, hornets, and wasps. It’s not always easy to find a good yellow jacket trap, which is why we have taken the time to select the top-rated products currently available on the market. With the help of this list, you will be able to choose the product that meets your requirements knowing that it will offer the quality and performance you deserve. With this product, you will be able to catch and eliminate yellow jackets, flies, and fruit flies. The trap is very portable, which means that you will have no problem taking it with you while traveling, hiking, camping, or when going on a picnic. You can also use it around the house, especially seeing as it does not use hazardous sprays or aerosols. The natural bait used in this option is effective in all geographic regions which helps cement its status as a great trap that you can take wherever you go in the country, and you can even use it abroad where it will be just as efficient. Using the trap is very easy, especially seeing as the unit comes with bait included. Once the trap is full, you’ll simply need to discard the contents in your normal trash collection bin and you will then be able to reuse the trap. The bait is 100% natural and contains protein and carbohydrates instead of hazardous aerosols and sprays that the classic solutions use. At normal temperature, the attractant will last about a week, and since the trap is reusable, you are free to purchase additional bait when the included one wears out. The trap is also effective in all geographic regions thanks to the use of the efficient and all-natural bait formula. The unit will also work for flies and fruit flies, which makes it ideal to use for camping, picnic, and cookouts. Customer feedback was very positive, with most of the users praising the efficiency of the trap and its portability. One key flaw of this option has to be the quality of the construction which uses very cheap plastic that can crack easily, especially if it is kept in the sun for extended periods. If you’re looking for a quality yellow jacket trap bait, the Rescue Attractant Cartridge is designed to work with the company’s traps and is capable of luring all the major species of yellow jackets. The high-performance cartridge lasts up to ten weeks and it does not contain poisons or pesticides. The option will work spring through fall and it can lure both queens and workers making it a perfect choice to use with your yellow jacket queen trap. The bait does not feature any killing agent, which means that the insects will die naturally. Similarly, beneficial honeybees will not be lured by the cartridge. The set contains five individually wrapped cartridges making it a good choice for people looking for a high-value purchase. The manufacturer recommends that you place it at least 20 feet away from the place that you wish to remain pests-free so that you don’t attract the insects near it. If used during the spring, this option attracts queens like honey attracts flies, and you can then use it throughout summer and fall to capture the other foraging workers. Unlike the little cotton ball and attractant that you can generally find at local hardware stores, these cartridges are not only more efficient but also easier to clean afterward. Since the bait is enclosed into the cartridge, there is no messy pouring necessary which means that you won’t have to worry about getting the bait all over your fingers. We found some customers that have used these cartridges for years and we are pleased to report that they are still satisfied with their purchase. The product is very efficient, and since you won’t have to charge the cartridge frequently, you won’t have to do much to keep the trap functional. A small number of users have reported that the products they’ve received arrived all dried up and unable to attract insects. The WHY Trap features two chambers and three attractants that are capable of catching 18 different species of insects so that you get a comprehensive solution for all of your problems. The top chamber uses two attractants to lure the insects, one is a liquid mixed with the water, and the other is a solid bait found in a vial. The bottom chamber, on the other hand, uses a liquid attractant poured onto a special cotton pad which leaves yellow jackets, wasps, and hornets with two ways to enter the trap, both of which will prove lethal. The double construction allows the trap to continue working for multiple seasons. All the baits used for this model are environmentally responsible and they do not include killing agents. What’s more, the trap will not attract or harm the beneficial insects so that you won’t have to worry that your new purchase will damage the ecosystem. With this affordable purchase, you get a set of three traps, which makes this package ideal for people looking to stock up and protect their home from pesky insects. The traps are reusable and do not contain toxic chemicals, poisons, or pesticides, nor will they harm the beneficial insects such as honeybees. You can use the trap during the spring to catch queens right before they build the nests, and again during the summer and fall to get rid of the remaining workers. With proven effectiveness against a wide range of species, this is a comprehensive trap that will keep your home protected. The trap does not require extra food bait and you can purchase additional attractant refills when the ones included in the kit wear out. While the manufacturer says the trap can capture paper wasps, we found that customer had troubles with this certain species. This disposable trap is highly effective in targeting and capturing all the major species of yellow jackets that can be found in North America. It is the ideal choice to use in camping trips and picnics since it will keep the surrounding area free of these pesky buzzing pests. The mechanism of this option is very simple and it does not utilize harmful chemicals that could be harmful to the environment. The trap uses the insects’ natural instincts that will make them enter the trap where they will begin to drown in the liquid found inside. Similarly to other Rescue products, this model uses the same powerful attractant and all you will need to do is add water to activate the powder and the surrounding insects won’t be able to resist this powerful lure. The manufacturer recommends that you hang the trap in a tree or bush at least 20 feet away from your activity area. The Rescue trap is perfect for people who spent a lot of time outdoors since the compact and portable design allows you to keep it in your bag and use it whenever you need to. It is very easy to get this option up and working – all you will need to do is cut the top on the dotted line, pull the tab up, add water, and hang it on a tree or bush. The attractant is 100% natural and it does not use poisons or aerosols that could be harmful to your health and that of your loved ones. Customers were shocked to see just how effective this nifty trap is, as in just a matter of hours it can get full of drowned insects. If you live in an area that is heavily populated by yellow jackets, you will need to get more traps since this one can last only for about a day before it gets full. If you are looking to get more bait for your Rescue traps, this kit offers everything you need at a low price, which makes it ideal for anyone looking to save money. The pack contains 16 attractant cartridges which contain environmentally responsible ingredients that can lure both queens and workers. Apart from catching yellow jackets, this is one of the few options on the market that can also attract and trap paper wasps. Additionally, bald-faced hornets, red wasps, and European hornets will also be a thing of the past. There are no killing agents used in this bait, and the insects will die naturally. Thus, if you are looking for the right attractant to use in your yellow jacket and wasp trap, this is the right choice for you. Customers were also very pleased with the efficiency of the kit, saying that they managed to catch even the most elusive insects. There is no need to worry that this option will lure and kill beneficial honey bees since the bait is carefully formulated only to attract pests. You can use the lures to kill queens in early spring right before they build nests so that you reduce the yellow jacket population around your home. Each attractant lasts for two weeks, which is more than enough, especially once you consider that the kit contains 16 units. The kit has an unlimited shelf life since it does not expire, which means that you can use it in your own time without having to worry that it will spoil. The bait is very efficient on its own, as you won’t have to add extra food bait into the trap. This option works best with Rescue traps, so you should be careful if you want to use it with a trap made by another brand. The Rescue option is the perfect choice for anyone looking for cheap yellow jacket traps to use in their yards and for camping. It is a highly effective and environmentally responsible solution for getting rid of not only 12 species of yellow jackets but also five different species of paper wasps, European hornets, and bald-faced hornets. The trap can catch queens in the spring right before they build their nest, which makes this option the perfect long-term answer to getting rid of these pesky flying pests for the entire year. Similarly, the trap is reusable and the durable construction allows it to keep working for multiple seasons and years. As is expected from most Rescue products, there are no poisons or killing agents present in this item which makes it a safe option to use as it will not harm people, pets or the environment. The two-chamber design allows it to catch more insects at once. This is one of the few traps available that can capture paper wasps, European hornets, and bald-faced hornets, making it a comprehensive choice. The trap comes with three different attractants and boasts two chambers that are capable of baiting more insects at the same time so that you get rid of them faster. You can reuse the trap once it gets filled or the bait wears out, especially since attractant refills are readily available for sale. Once it gets inside the trap, the insect won’t be able to fly out and it will either drown in the top chamber or dehydrate in the bottom one. It will not lure beneficial insects so that you can safely use it in your yard or garden. There are reports of customers receiving their trap with dried out attractant which can render the product completely inefficient without a refill. By using a mixture of sugar and water to bait yellow jackets, bees, wasps, and other dangerous insects, this trap is 100% eco-friendly. You can use it around the house without having to worry about dangerous poisons or killing agents that could harm your family and the environment. The product has a versatile design which allows it to be used either on a tabletop or you can instead hang it in outdoor areas. It comes together with a 22-inch long cord that will allow you to hang the unit on a tree or any other overhang so that you can keep any outdoor space free of pesky bugs. It is very easy to use and the top of the container can be unscrewed quickly, which provides owners with a fast and straightforward way to empty the trap of dead insects and to then refill it with a new mixture of sugar and water. The insect trap features six different entry funnels that will lure wasps, yellow jackets, and other pesky insects inside. The unique design of the funnels will prevent insects from crawling or flying out of the trap and back in your garden. The eco-friendly mixture of sugar and water makes this unit safe to use around your family and eliminates the need of having to buy expensive attractant. Since the trap is made from durable transparent plastic, you will immediately notice when the insects or sugar residues begin to build up. Even if it uses a very simple lure, the Pure Garden product is very efficient and it will continue to work for years to come. Unfortunately, if you want to get an option that will not attract and kill beneficial insects such as honeybees, you will have to look somewhere else. The Cypropid option is another simple trap that can get rid of all the annoying, and oftentimes dangerous insects that live in your outdoor space. All you will need to do in order to use it is to add some sugared water or beer inside the container, flip the switch on, and then hang it to a tree or place it on a flat surface. The trap is designed to kill yellow jackets, wasps, hornets, and other pesky insects so that you can enjoy a bug-free space. With this option, you will be able to catch an unlimited amount of insects since it is constructed from a durable and heavy-duty plastic that can provide long-lasting performance. Another big plus of this model is the fact that it includes a blue light that generates a warm glow designed to increase the trap’s attracting power greatly. The blue light will turn on automatically at night and is powered by solar energy. It features double-entry tunnels on both sides of the trap to increase the trapping power of the unit even further. The only lure the trap uses is sugared water, which means that you will be able to replace it using ingredients you can find in your kitchen. The unique design of this model includes a UV light that will allow the trap to be even more efficient during the night when insects will get drawn to the blue light. The pack contains two traps that you can use to secure both the outdoor and indoor space of your household. The manufacturer is very confident in the quality and reliability of this product, which is why if you are not satisfied it, you are guaranteed to get your money back. The sugared water can lure beneficial insects as well, which might be a problem if you only want to get rid of yellow jackets. This particular trap is very effective at luring and catching bothersome insects with the help of an irresistible mixture of sugar and water. It can catch yellow jackets, hornets, and wasps so that your outdoor space can be safer for you and your family to enjoy. The trap is reusable and uses a non-toxic lure. What’s more, if you want to catch more insects, or you want to get rid of a particular pest that’s been bothering you, you can add your own mixture of meat and sweet ingredients and watch how the pests will come to your trap. It is very easy to use since all you will need to do the moment you get it out of the package is to place the mixture inside and just hang or place it where you can see the flying insects buzzing around. The use of ABS plastic will guarantee the durability of the unit. With this alternative, you get a pack containing two high-quality traps that you can reuse for years of reliable performance. Thanks to the multiple entry tunnels, once the insects get inside, they won’t be able to fly or crawl out. This a non-toxic trap which means that you can use it near the areas where your children play since it won’t leave toxic fumes in the air. Thanks to the versatile design, you will be able to place or hang this option anywhere you want, especially as it comes supplied with an 18” nylon cord. The manual will teach you how to prepare the perfect lure that will catch all the nasty bugs in your garden. Not all customers were satisfied with the sugared water lure, but thankfully, you can replace it with any type of attractant that you want. If you are looking to get a yellow jacket attractant that you can place in your trap and leave for weeks without having to worry that it will wear out and stop luring insects, the Rescue alternative is the right option for you. This high-quality choice can continue to lure in all major yellow jacket species for up to 2 weeks. This offer will give you 10 packets so that you get a supply that will last you for many months. The attractant does not use killing agents or any other toxic ingredients that could pose a serious danger to human health and the environment. It is well worth mentioning that for the best performance, the manufacturer recommends that you use the attractant with the Rescue Yellowjacket traps. As far as customer experience is concerned, we are glad to report that for the most part, users had only great things to say about this option. Unlike a classic mixture of water and sugar, this comprehensive formula will not attract beneficial honeybees which are essential to the ecosystem. Using the vials is very easy since they are constructed in a way that makes it difficult for the content to get spilled on your skin. Buyers are very satisfied with this purchase and many claim that they work so good that their trap gets filled to the brim in just a matter of days. The attractant can lure queens during the spring so that you can lower the local population by preventing them from building nests. While the seller mentions that customers will get ten packets, some have reported that they only received one packet. Unlike other options that can also attract hornets and wasps, this option will only work on yellow jackets. What’s unique about the Everyday Home trap is the fact that it serves a practical and decorative purpose. The trap is made of colored plastic that can blend beautifully into your outdoor décor. What’s more, the visually pleasing design will prevent any of your guests from noticing the yellow jackets, hornets, or wasps trapped inside the catcher. Additionally, you can also use this option for outdoor get-togethers, picnics or camping since the trap is highly portable. To get the trap working, you will simply need to add a mixture of water and sugar that will bait yellow jackets, wasps, hornets, and other dangerous insects. Once the pests get inside, they won’t be able to escape this artificial beehive. If you are not happy with using sugared water as an attractant, you can still use any of the numerous baits available on the market or even use food to make your own bait at home. The trap comes with an attached cord which allows you to hang it on a tree or bush, but you can also place the unit on a tabletop if your outdoor space allows. Thanks to the use of heavy-duty materials and sturdy construction, the unit is weather-resistant and reusable to provide you with years of service. With a weight of just 7.2 ounces, you will be able to set up and use the product anywhere you go. You can clean the whole yellow jacket catcher by simply turning the bottom of the nest shape counter-clockwise which will reveal the hollow interior. You are free to use any bait you like if you don’t want to attract beneficial species of insects such as honeybees. Not everyone will be fond of the bright yellow material used as it can stand out a bit in certain environments but for the most part, buyers were thrilled with it. It is not always easy to find the most effective yellow jacket trap since there are so many options available right now which make it more difficult than ever to identify the right product for the job. Things can get a bit easier once you get familiar with the key features and factors one ought to consider when purchasing this type of product. We know that you don’t have the time to read yellow jacket trap reviews, consumer reports, or expert feedback, which is why instead, we have gathered all the crucial information in one place for you. All the data we’ve collected will be presented in the buyer’s guide below. Which type should you get? Yellow Jacket traps are quite straightforward, and most of the options on the market follow a very similar design that involves one or more chambers full of liquid in which the insects will drown. Some alternatives may instead use an empty chamber from where the pests can’t get out until they die from dehydration. If you live in an area that is heavily populated by pesky insects, it is recommended to either get multiple traps or to get options that come with multiple chambers capable of trapping and killing more insects at the same time. You can also find indoor traps, but don’t assume that these are designed for you to use in the living room. They refer to indoor structures such as garages, chicken coops, garden sheds, and greenhouses, all places which can provide a perfect environment for yellow jackets to build their nest. When using indoor traps, you should make sure that the attractant you use is non-toxic. Similarly, if you want to get rid of yellow jackets in your greenhouse, make sure that formula you use won’t attract and kill beneficial insects such as honeybees. Similarly, it is important to know that some traps are disposable while others are reusable. Choosing between the two depends on your preferences, but if you wish to get the best value, a reusable trap will give the best bang for your buck. After you purchase your desired trap, it is time to go and pick the right bait for the job. While certain traps are designed to work with a basic sugared water formula, most will require a more specialized attractant. Options that work with a mixture of water and sugar are the easiest and cheapest to maintain. The downside of using sugared water is that the bait will attract beneficial insects as well, which, depending on where you use the trap, might harm the local ecosystem. A good solution to this problem is to purchase attractants that are specially formulated to catch only certain species of insects. You can also prepare homemade bait, and some traps may even include a few recipes in the user’s manual. During the spring and the early summer months, since yellow jackets spend a lot of their time looking for protein, you can add meat in the trap. Do remember to change the meat daily since the insects won’t eat spoiled meat. During the late summer and fall months, you can spread syrup or jam along the inside of the trap to mimic the nectar that yellow jackets and wasps crave naturally. If you have a serious yellow jacket problem and you need a trap ASAP, there is an easy homemade yellow jacket trap that you can build using items you have available around the house. Thus, this option will help keep these pesky insects at bay until you can get your hands on a high-performance trap. The materials you will need include a large 2-liter bottle, 1 cup of apple cider vinegar, ¼ cup of sugar, 4 cups of water, one banana peel, and a razor knife. First, you will need to prepare the mixture by pouring ½ cup of water into the bottle and adding the sugar. Once the sugar has dissolved, you can add the apple cider vinegar and shake the bottle again. Finally, add the banana peel, and pour more water until the bottle is half full. To prepare the trap, you have to cut a ¾-inch hole in the top half of the bottle and place it next to the hive, or away from your living area. Where should you hang the traps? Experts recommend that you place the trap next to a food source such as an outdoor trash bin since wasp, hornets, and yellow jackets like to swarm around the garbage for food, especially when the temperatures rise in the summer. Similarly, you can target areas with standing water such as pools and ponds and hang a few traps around them. Do remember that traps should be placed around 20 to 30 feet away from the area that you and your family members normally spend time in. As far as when to put out yellow jacket traps, most options on the market are designed to work for multiple seasons. If you want to cut down on the population, you can use your trap during the spring to catch the queens before they have time to build the nest.